— BugsInTheNews is a VIEWER-PARTICIPANT WEBSITE. This article by Jerry Cates and Walter Fuller was first published on 2 May 2012 and revised last on 19 May 2012. © Bugsinthenews Vol. 13:05(01). 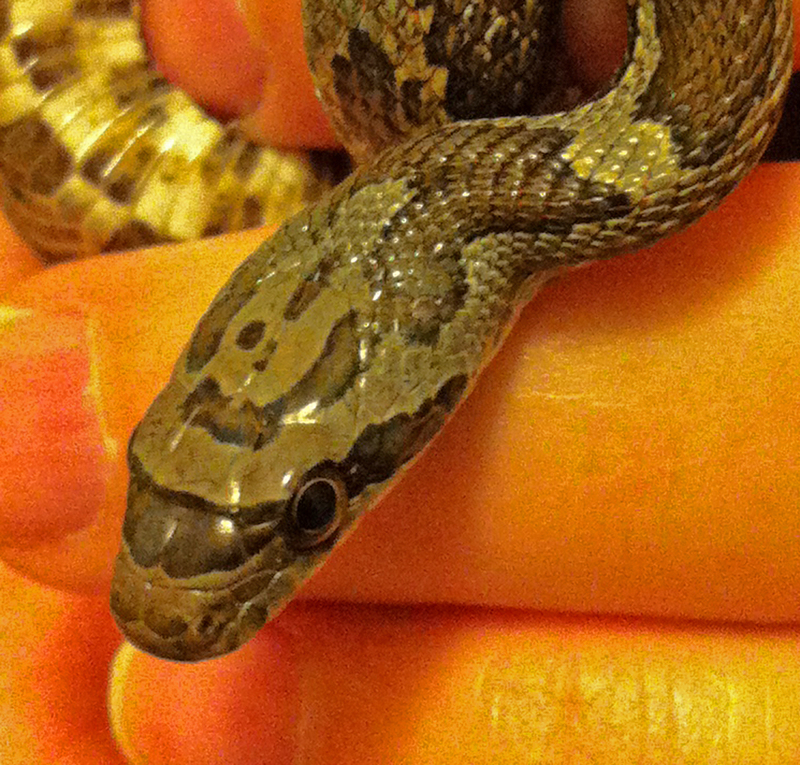 I saw your discussion of the rat snake on your website Bugsinthenews.com when I was looking for photos to verify that the snake I found on my doorstep was indeed a rat snake. Sure enough, my initial identification proved correct. 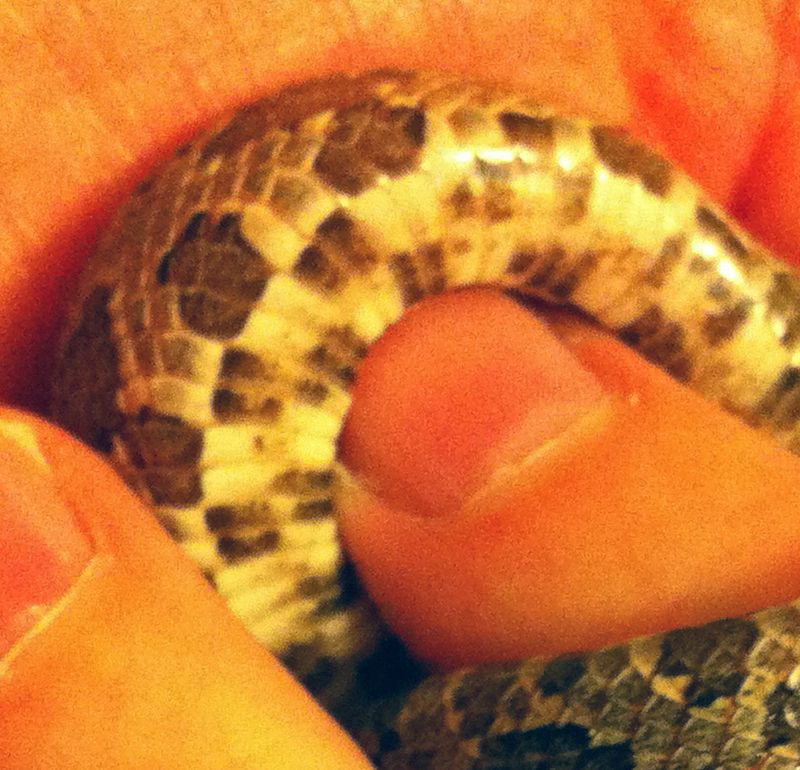 You mention in your article that the Texas rat snake is very aggressive, but I did not find that to be true. This snake made no attempt to escape (although I’ll have to point out he was surrounded), and allowed me to pick it up without trying to bite me. At times, though, he vibrated his tail – I suppose that indicated nervousness. Several of us passed it around to examine it, and it was constantly in motion at first, although after about five minutes it became content to wind itself around an available set of fingers and stay somewhat still (see photo below). I estimate it’s total length to be about 15 inches. Does that sound about right for a 1 year old snake? Or maybe one that hatched last autumn? Anyway, the only aggression he showed was biting me once when I made a sudden movement with my hand in front of his face. However, if I hadn’t been looking from the corner of my eyes, I would have never known he bit me because his mouth is so small. After about 20 minutes, I released it, whereupon it very quickly made good its escape. Just like the person who sent you the 2003 photos, I, too, live in Frisco! Small world, eh? Great photo. If you have the full-resolution image please send it. 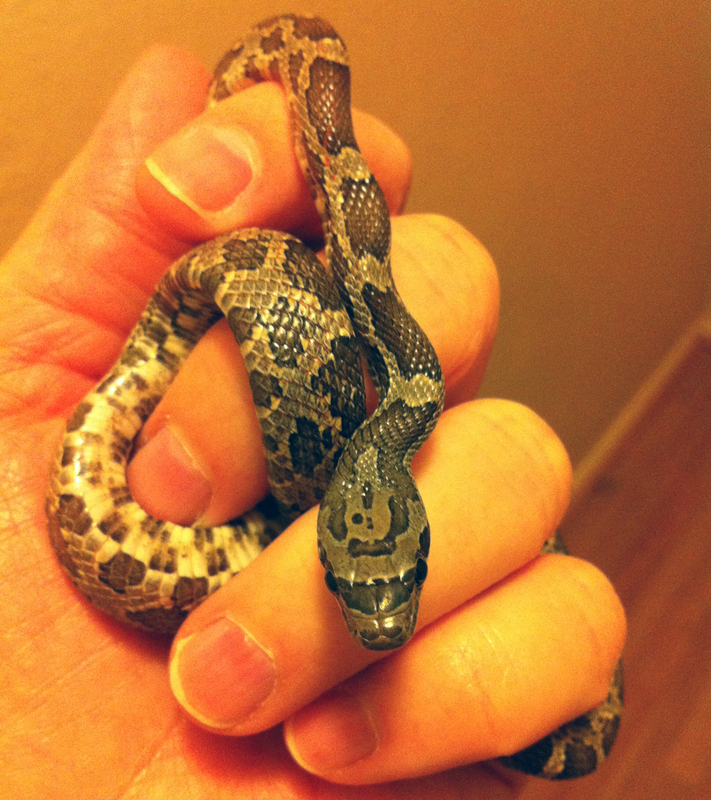 I am preparing a new article on juvenile rat snakes, and will be adding your photo this morning. If you can send the higher resolution version I’ll be able to post enlargements of it to show other characters that are not immediately obvious with the low res photo. While it is true that mature, wild-caught Texas ratsnakes are extremely pugnacious, juveniles of that species, and of many of our other ratsnake species, are either docile and easy to work with, or — for those that are pugnacious — their small teeth are too puny to inflict any damage. 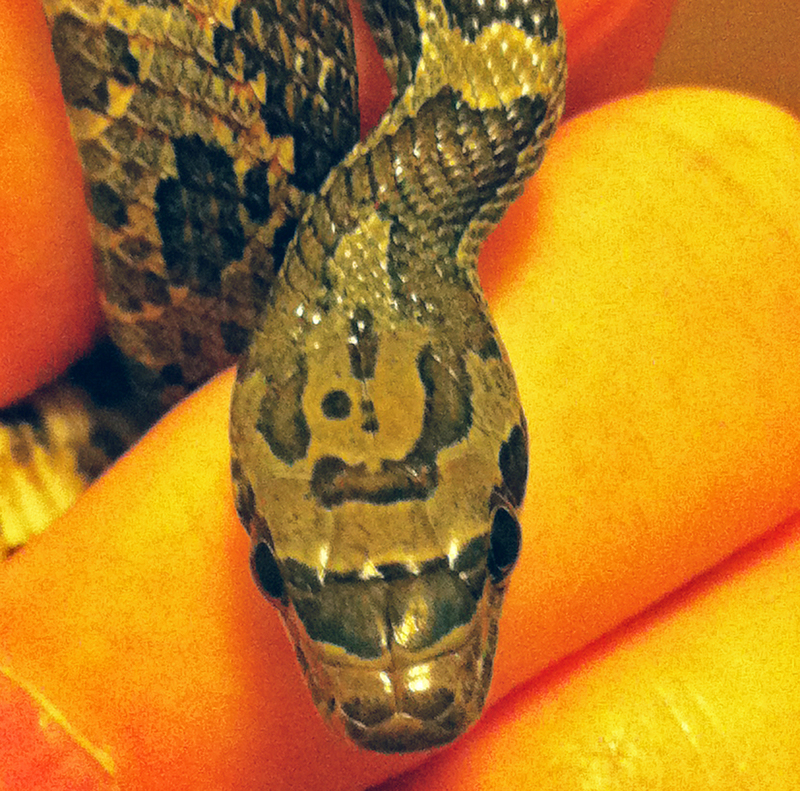 Any juvenile that is handled regularly will quickly become a very human-friendly snake. Mature Texas ratsnakes, and some — but not all — of our other ratsnakes that mature in the wild without human handling are sometimes impossible to domesticate, however. Walter very kindly sent the high resolution images, which have since been processed and are now posted on this page. Besides using slightly different nominatives than many are used to, our discussion will be complicated by two additional points. First, in some of my earlier postings on Bugsinthenews.com, I naively lumped several juvenile ratsnakes under the broad umbrella of “Texas ratsnakes” when, with the evidence at hand, a precise judgement on the snake’s placement within the various ratsnake taxa could not be assured. Walter read one of those postings, and — based on my imprudent assertions — arrived at an unwarranted conclusion. Second, the taxonomical classifications of many if not most of the serpents worldwide are undergoing significant revision due to recent phylogenetic analyses. I am not the only student of herpetology who has run into difficulty when attempting to assign generic and specific names to ophidian specimens, particularly juveniles, caught in the wild. Even with a relatively well-stocked reference library the challenges attending such tasks are daunting. The various authorities on herpetological taxonomy often disagree with one another, and precise definitions of anatomical characters that apply to one species over another have sometimes been lacking, and at other times contradictory. All the major authorities have decried the primitive state of herpetological specifics, yet revisions in taxonomy have moved slowly. That pace, however, recently accelerated when several investigators (e.g., Utiger, et al., 2002) convincingly demonstrated that North American ratsnakes previously classed together with the ratsnakes in the Old World genus Elaphe, along with closely related genera (e.g., bull and gopher snakes in the genus Pituophis and king and milk snakes in the genus Lampropeltis, among others), form a monophyletic group distinct from Old World members of those genera. A consequence of this finding was to temporarily resurrect the “archaic” genus Pantherophis Fitzinger as the generic name for all North American taxa north of Mexico. In 2008, this revision was accepted by the SSAR, and is currently the appropriate nomenclature that should be used for these serpents. Accordingly, steps are being to apply the new nomenclature to all postings on Bugsinthenews.info. The listing of North American serpents will soon be fully revised to bring it into conformity with the accepted scientific and common names listing of the SSAR. The specimen in Walter’s possession seems clearly to be a ratsnake (all North American colubrids that were once included in the genus Elaphe could rightly be classified as ratsnakes, though the designation was not very precise), but how do we know that? it was not a Texas ratsnake (previously classified as Elaphe obsoleta lindheimeri, now as Pantherophis obsoletus) because it displayed — albeit imperfectly — a spearpoint marking on its dorsal crown, which character is wholly lacking in the Texas rat snake juvenile. Under the older, now-defunct nomenclature it would have been more accurate to classify it as Texas cornsnake (Elaphe guttata), which according to some (Conant & Collins, 1998; Tennant, 1998) was then represented in Texas by but one subspecies, the Great Plains ratsnake (Elaphe guttata emoryi), and to others (Werler & Dixon, 2000) by three separate subspecies, including — besides the Great Plains ratsnake — the type species known simply as the cornsnake (Elaphe guttata guttata) and the southwestern ratsnake (Elaphe guttata meahllmorum). Under the new nomenclature adopted by the SSAR, the best we can do with absolute certainty, given the evidence presented in the photograph Walter supplied (the same can be said for all the juvenile ratsnake images I’ve worked with from 2002 forward), is to classify his snake as a North American ratsnake juvenile in the genus Pantherophis. Currently, 9 species are assigned to this genus. Some (e.g., P. bairdi, P. gloydi, and P. obsoletus) can be ruled out on the basis of visible, gross morphological characters, as will be seen from the following descriptions. However, caution must be exercised in any attempt to identify a candidate specimen to one of the remaining species, even when certain of the recognizable characters (e.g., scutellation) appear on the basis of photographic evidence alone to be a close match, inasmuch as reliance on photographs, without the benefit of carefully examining the serpent in the lab, too often leads to error. 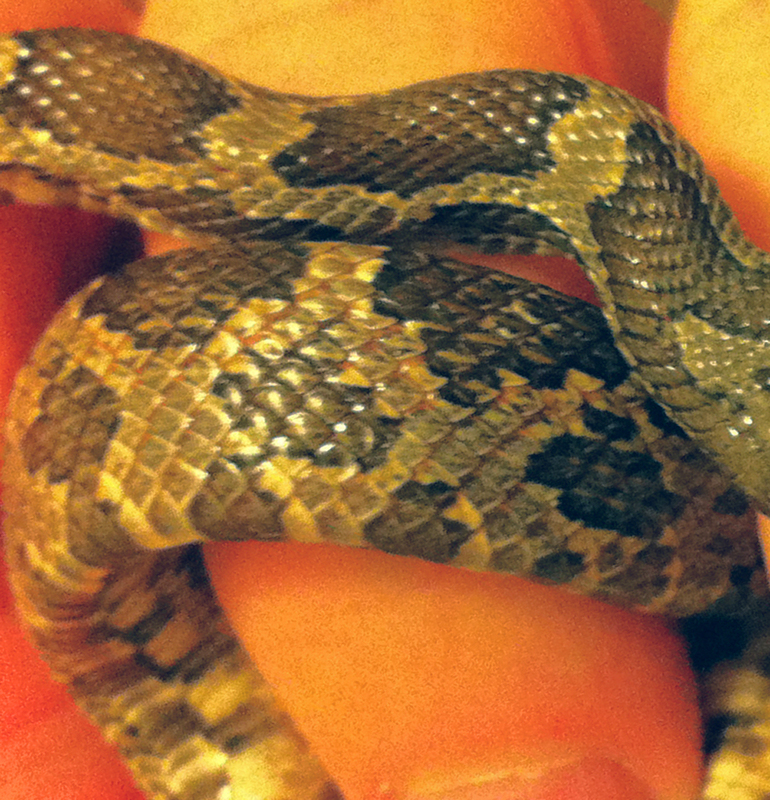 In addition, considerable variation naturally occurs between individual snakes within a litter, and the range of variation within a given species may be so broad as to overlap with those of its sister species. Mention must also be made of the applicability of natural range information for given species, as indicators of the identity of a serpent found within a specific locale. Such information is, in my opinion, of little value. The pet trade in ophidians, both officially (i.e., in full compliance with federal and state laws and regulations) and unofficially (and, thus, often conducted without regard to the laws and regulations of the locale where the ophidian was collected and/or traded), is a robust industry. Many reptiles that are collected in one locale are released (accidentally or intentionally) a considerable distance away, often outside the natural range of the reptile. There the foreigner may be witnessed, photographed in the wild, and caught by collectors who generally presume it to be native to the area. Not one of our serpents is exempt from falling afoul of such unnatural, human-mediated redistributions, and — as a result — a serpent encountered anywhere in North America should be compared with all N.A. serpents before arriving at a conclusion regarding its taxonomical identity. The photographs Walter supplied clearly — or in some cases not so clearly — tell us the following about the serpent they depict: 1. The face, depicted in fig. 101, does not have a facial pit between the eye and nostril; 2. The prefrontal scales depicted in figs. 101 and 102 are two in number; 3. A loreal scale is present (fig. 101); 4. The eye, as depicted in fig. 101, is round, with a circular pupil; 5. The diameter of the visible eye (as depicted in fig. 101, entirely within the orbit circumscribed by the surrounding scales) is approximately one half the distance from the leading edge of the eye to the tip of the nose; 6. The head, as depicted in fig. 101, has two postocular, 3+4 temporal, and no subocular scales; 7. An accurate count of this serpent’s labial scales cannot be made from any of the photos Walter provided; 8. Midbody for this serpent cannot be defined, as the entire body is not visible, but the scale count for the lateral portion of the body depicted in fig. 103 displays a total of 12 dorsal scales which, if repeated on the side not shown would render a scale count at this position on the body of 23 dorsal scales; however, though a total “mid body scale count” can be inferred, one cannot be verified from these photos; 9. The first spinal blotch on the neck bifurcates forward, onto the dorsal head, to form a marking on the left and right side of the crown that then rejoins over the eyes; 10. A broad dark eyemask crosses the forehead, through the eyes, and extends backward to the angle of the mouth; this eyemask does not appear to extend beyond the mouthline onto the neck; 11. Ventral scales depicted in fig. 104 are pale yellow in color, checkered with light and medium brown markings. Note: in the current species list no subspecies are listed; one may presume this state of affairs is only temporary, and that this list will be broadened to include a number of subspecies as it is subjected to several revisions over the coming months and years.